Wahkeena Falls is a 242-foot (73 m) waterfall in the Columbia River Gorge in the state of Oregon. The waterfall is unlike nearby Multnomah Falls in that the water does not directly plunge to the ground. Wahkeena Falls, rather, has a more subtle cascading flow. These falls have been featured in numerous travel guides and in photography books. Spellings of this name are dubious because the word is an English transliteration of a Native American (reportedly Yakama) phrase meaning most beautiful. Wahkeena Falls is along the Historic Columbia River Highway, about 13 miles (21 km) east of Troutdale, Oregon. A 0.2-mile (320 m) hike from the parking lot at the base leads to the stone bridge that crosses the main part of the falls. That trail continues on east to Multnomah Falls, the next falls to the east. This waterfall is visible directly from the Historic Columbia River Highway. 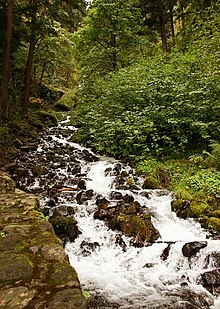 ^ "Wahkeena Falls Hike". Portland Hikers Field Guide. Retrieved 2013-02-28. This page was last edited on 27 July 2017, at 04:54 (UTC).